So, a redditor going by fest- has created a really nifty tool for quickly threshing out monsters for 5th Edition, called CritterDB. It won instant points with me for using “critter” as a generic reference for what 5E calls “creatures”, since that’s one of my own habits. You cannot (yet) set an arbitrary size for the hit die; it will always use the default hit die size for the creature’s size class. You might have to hit “save and continue” after changing the critter size to update the hit dice. It treats senses, vulnerabilities, etc., as individual items, not raw text, so you have to hit enter after typing, say, Darkvision 60′ in order to get it to save the value. The “specific value” field for saving throw/skill bonuses is currently ignored if you try to set it to 0, since this registers the same as not having any value set. It has no CR calculation/estimation capabilities, so you’ll still have to do that yourself according to the table on page 274 of the Dungeon Master’s Guide. It does have some neat features, though. 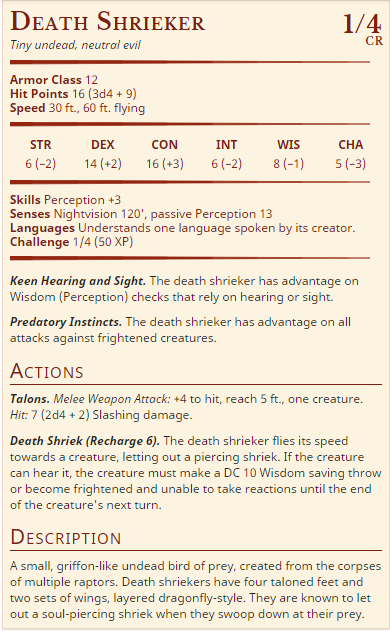 There’s a macro for quickly generating correctly formatted attacks, it auto-generates a stat block for the critter, will include the necessary traits if you specify a specific humanoid race, and you can copy a stat block you’ve already created. This latter feature is hugely useful for making variant monsters; just enter a generic critter from the SRD like “kobold” or “zombie” or “commoner” into your bestiary and then make and edit copies as needed and you can have fast zombies, strong zombies, legless zombies, etc. It also lets you create multiple bestiaries (folders) for organizational purposes.